Last fall, my friend Lydia and I, did some craft shows around town. One of the items we made up that were well loved was burlap wreaths. So simple to make and I love the versatility! :: One grapevine wreath :: Easy to find - hunt down a coupon for Michaels or Hobby Lobby or JoAnn's - and get a nice sized wreath. :: Burlap :: - I found mine at JoAnn's. Cut 2" wide strips roughly 10" - 12" long. 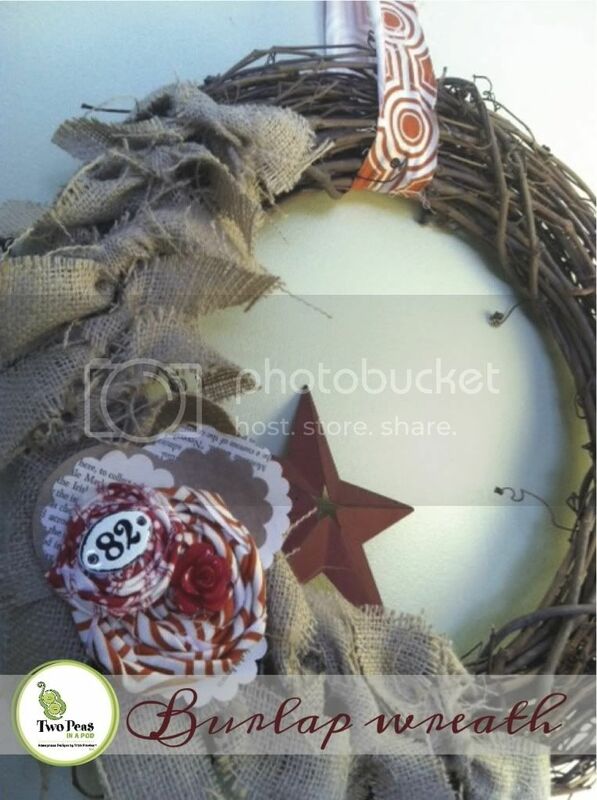 Tie the burlap strips on your wreath adding as many as you would like. Cover the whole wreath. Cover part of it. But if you're going to cover ALL of it - then I'd find a wreath form that is as inexpensive as possible since it won't be seen. :: The accents :: I made 2 rolled roses and layered them together and added a pretty rose button on top. I also added a metal number plate found in the scrapbook section at the store. In addition to that, I used a paper punch and an old book destined for the neighbors garbage, and punched some pretty shapes and added those around my rolled roses. I propped up a metal star inside the wreath once I had it on the wall. And I used a long strip of fabric to make a bow to hang the wreath on the wall. Pretty. Perfect for Winter. Or anytime of the year.